Having a place to sit while you entertain guests is a useful addition to any completed structure. 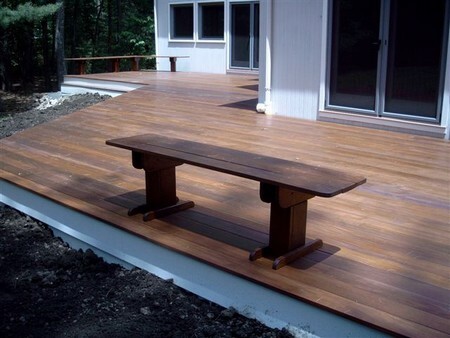 It is commonly known that decks are often used to entertain guests, and building a deck bench is functionally essential and aesthetically pleasing. The design and number of seats depend on your preference. It may also be moveable or a permanent fixture on your deck. A moveable structure retains flexibility to space movement and use. To prevent obstruction of view, go for a backless design. Or if you are planning to lounge (i.e. by the pool deck), then a deck with back support will function well. There are various possibilities to your design, depending on the use. The following are some tips on how to build a deck bench. (1) Decide on the size (and materials). Normally, the seats are approximately five feet long. If so, you can easily obtain 2 x 4 wood panels from your local hardware store. One of the best material to use is cedar wood. It gives sturdiness and stability to your seats. Measure also the depth of the seat, length of base and height of back. Do you want armrests? Also, determine the height of seat from ground. When you’ve figured out these, the next step is to cut the wood according to size. (2) Cut and assemble wood frame. Seat plank, armrests, back support and bench legs are cut according to the design layout. Plan wisely so that you will not waste material and incur higher cost to purchase new wood. It is exciting when you have all the wood parts ready. Place each part into position using drills, nails, bolts and nuts, and wood glue. Ensure that the screws are tightly fastened and the benches are safe to sit in. (3) Paint, stain and sand. The last step is to sand and paint the seats to give it a more polished look. It is also an important step because your seats will last longer that way. To prevent water from pooling in the seats, you can set the planks and inch apart. This also gives air circulation during hot summer days. A free standing bench is a better option if you want to move it into your home during winter. Otherwise, you can anchor it to the deck floor. These are ways on how to build a deck bench. Feel free to explore the available building plans and options available through various sources.